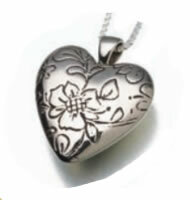 The Bronze Floral Heart Cremation Pendant is available in Bronze or White Bronze. The Bronze pendant which has a subtle antique finish. The White Bronze pendant (see small photo) also has a subtle antique finish which highlights the etched floral design. The delicately etched flower and leaves are only on the front side of this pendant. A tiny amount of cremains can be inserted through the top which unscrews. The back of the pendant has a satin finish which can be engraved for an additional fee. Please limit engraving to no more than 8-10 spaces per line. Please allow one business day for engraving before pendant ships. This small pendant is almost an inch wide and almost an inch high. Included with each pendant is a black velvet gift box, filling funnel and instructions, care card, and a small funnel. Nonengraved pendants usually ship same business day if order is placed by noon Eastern Time. Ships from the Midwest.